Japanese-born Takeishi has over 30 years experience in producing experimental music, which holds a candle to many a genre. Utilising analogue and electronic instrumentation, the results have been somewhat varied and I wish the same could be said with this latest album; as there is little that shines throughout. ‘Prologue’ and ‘The Visitor’ provide a web of pulsating, yet pointless drones; and it isn’t until the simplistic keys of ‘Abandoned Shadow’ that we get anything resembling something of worth, that can be defined as actual music. ‘Glimpse of Silence’ is a patch of electronic nonsense as is the rest of the album. Hums, bleeps and throwaway random self-indulgence that bears little worth, with even less to say about it. Utilising the possibilities of improvisation between analogue instruments, effects pedals and voice is nothing new; many will try and many will fail and a small few will succeed in producing something worth listening to. The key word I am playing on here is ‘improvised’. Benkho actually has things more on an even keel than I envisaged. There are moments on this latest release that steadily progress, without an inkling of falling apart; such as ‘Deep Love Below the Earth’, that builds and allows all the futuristic sounds to build upon each other well. However, for the most part ‘A Trip to Space’ is a mish-mash of sounds that filter through randomly (of no surprise considering improvisation) and without any concern for meaning, care, or indeed worth. This is a pity, because in some stages, Benkho does appear to have his head screwed on; and I get the feeling that if he actually sat down and constructed something like this a little less randomly, then it could actually be quite special. The Demark based Clang label is awash with a mass of sound experimentalists. There are the odd few that shine, such as the impressive Wavemultiplier and Anders Holst; and some that fall way below the mark and are simply unreviewable. Infernal Machines fall somewhere in-between. When this duo gets going, as in midway through ‘Is That a Light’, I can almost see what they’re trying to achieve; with a virtual hypnosis present amongst an impossible wall of layered electronics. Then it all falls apart on the clattering mess of ‘Ashen Lines’ and tacky electronics of freeform ‘Steady Jolt’. Regardless of the obvious talents that Infernal Machines may have; these are hidden amongst a wall of self-indulgent musical theatrics that are as unnecessary as they are ridiculous. This Danish duo utilise for the most part, a medium I don’t usually think works on an actual recording. Most of the output is improvised live recordings; but here Holst and Nielsen have layered them down with overdubs, which adds to the construction of the tracks on offer. Airy pads and guitar drones make for an otherworldly feel to the proceedings, with the clattering of percussion kept to the background. The production gives a large spatial awareness that can only assist the ambient qualities of this self-titled collaboration. Through spontaneous interaction they have both created an album that smatters of immediacy and urgency in sections. I have never been a fan of Tibetan bells and the like, as anyone who has read my reviews will note; however, these are few and far between on this release and it’s the Fennesz-like quality of the guitars that shine throughout (such as on the excellent ‘Star Riser’). Steadily drifting between Dark Ambient and subtle noise, keeps the listeners attention and for the most part, this duo fail to detract from the path they have chosen. This continuity on actual musicianship across the majority of songs; makes for a worthwhile afternoon’s listening exercise. As debut albums go, Swedish producer Marcus Wrangö has created something that is way more worthy than that of a digital download. ‘4040’ would benefit more from being a physical release; and it’s disgraceful that no one has picked this up to do so. Marcus’ stage moniker pretty much encapsulates everything that the project is about. Sparse techno and electronic saturation that is stripped bare, plays out with a simplicity that is both hypnotic and engaging from the off. Subtle influxes of sound that are applied to each track are key in forming a cohesive glue; and help keep momentum as the beats patter on in low-fi form. 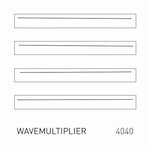 Both futuristic, yet nostalgic; Wavemultiplier, has an essence that toys with older forms of electronic music, cleansing the multiform overtones as they glide over a bed of rhythmic pulses. In fairness, there is a great deal of repetition with ‘4040’. However, this is essential in making this album what it is. Where other albums with a similar structure fail; Wrangö keeps form and the journey is far from tedious. Here be the lesson in how keeping something simple, is sometimes the best way to go.